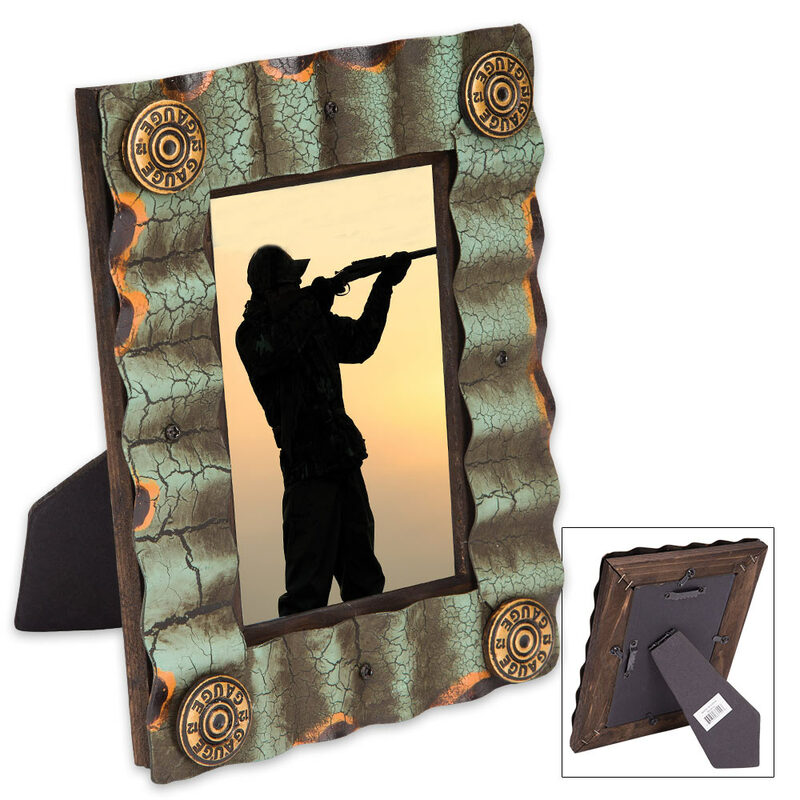 Rustic Corrugated Picture Frame with Bullet Accents - Fits Standard 4" x 6" Photos | BUDK.com - Knives & Swords At The Lowest Prices! 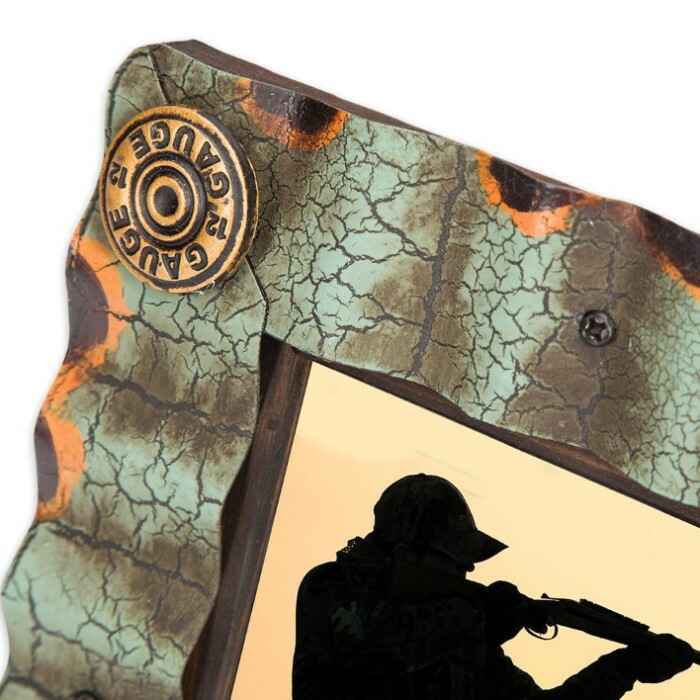 Perfect for sportsmen and firearms enthusiasts, this unique bullet-studded frame enriches any 4" x 6" photo or art with an alluring sense of adventure and rustic charm. Bullet cartridge bases adorn each corner of the distinctive corrugated border, which is subtly patterned and accented with splashes of cleverly-placed color. Stylish weathering throughout adds chic vintage appeal. Both beautiful and practical, the frame safeguards your favorite art piece or a treasured photo, keeping the cherished memories it depicts alive for generations to come. 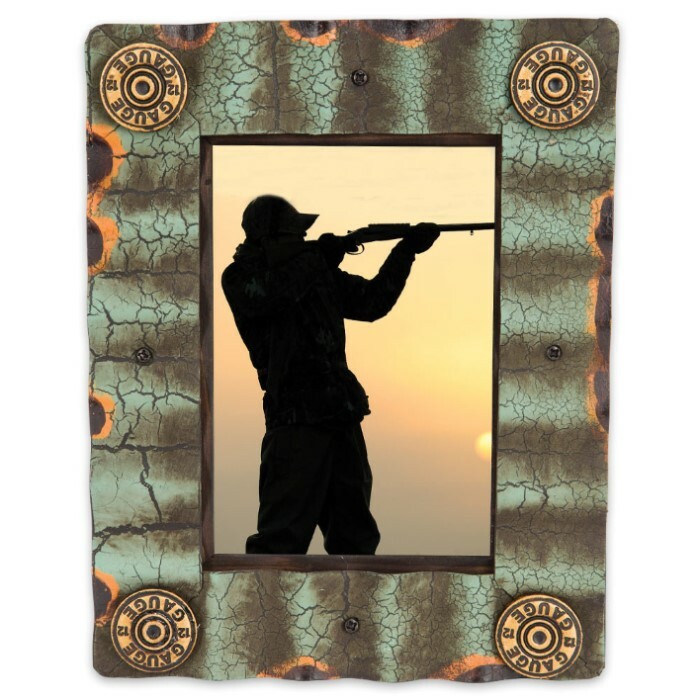 The crystal clear acrylic window protects against smudging, scratching, corrosive skin acids and environmental damage, and is perfectly sized for any standard 4" x 6" photo. Ideal for any space in your home or office, the corrugated bullet frame includes a sturdy built-in stand for table display and robust metal hardware for easy wall mounting. Get two - one for yourself and one to gift to a friend or family member! It's a lovely gesture sure to be fondly remembered for years - especially when accompanied by a heartfelt photo!